When you hear that it's the thought that counts, part of that is actually remembering to do something. This Valentine's Day impress your partner with a gift that takes almost no effort, but hits all of the romantic highlights. 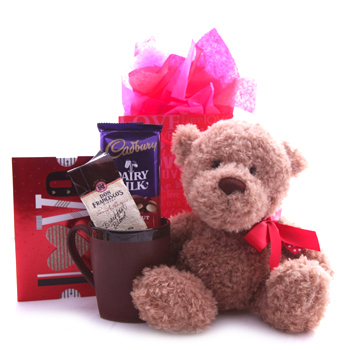 She'll receive an adorable Stuffed Plush Bear, a Valentine's keepsake any girl would envy, along with a bar of Imported Milk Chocolate (100 gr), a bag of irresistible ground Coffee (250 gr), and a cute new Coffee Cup! Ask her to be yours all over again with Tender Affections.